From the small towns of Supino and Stiffe Italy, Arnaldo and Elda Fracassa brought the aroma and great flavor of Italian cuisine to the big city of Dearborn, Michigan. They began cooking primarily Italian food in the basement of their east Dearborn home for family gatherings. Word spread quickly and before long neighbors began asking Arnaldo and Elda to cook for their events. They were soon catering for community as well as local church events. 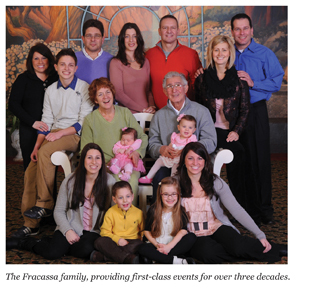 As time went on, larger groups began requesting the Fracassa familyʼs services and expertise. In time, the family took their catering business to the next level. In 1987 the headquarters were moved to Riverview, Michigan thus Arnaldoʼs Banquet Center was born. Since then the business has grown into one of the most well known banquet centers in southeastern Michigan. The services provided range from elaborate elegant weddings to casual corporate luncheons. Though the business has grown the Fracassaʼs attention to detail has remained the same. The award winning cuisine is sure to please. Arnaldoʼs is proud to provide sauces, soups, entrees and more made from scratch using their time honored recipes as well as contemporary menu items. Youʼll not find processed or boxed food at Arnaldoʼs Banquet Center. We strive to provide as much fresh local product as possible. Planning the perfect event can be stressful and confusing with so many decisions to make. That is where the staff at Arnaldoʼs comes in. From the moment you walk into the office for your first meeting until the moment you leave the venue at the end of your event, the staff is available to lend their expertise to make your event as worry free as possible. The staff will work one on one with you throughout the planning process to insure that every detail of your event has met your specifications. Arnaldoʼs Banquet Center will put you in touch with vendors who will help simplify your event while still making it special and unique. generation. This is what makes Arnaldoʼs unique. Every customer and guest that walks through the doors of Arnaldoʼs Banquet Center is treated as if they are part of the Fracassa family.